The February holiday of Presidents Day makes a three-day weekend worth celebrating Up North because we have snow, snow, snow. Whatever your snow pleasure--downhill skiing, cross country skiing, snowshoeing, snowmobiling--this holiday weekend is the time to play in the snow. Because this holiday is often combined with school winter breaks throughout the Midwest, snow lovers come to Northern Michigan during February. 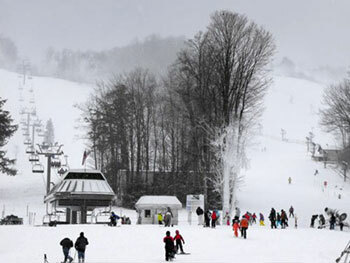 Our three ski resorts--Nub's Nob, Boyne Highlands, and Boyne Mountain--roll out the red carpet during Presidents' Weekend with special activities for the entire family. Tubing, boarding, ski school, kid's races, terrain parks, sleigh rides--a snow experience. The Northern Michigan communities of Petoskey, Harbor Springs, Charlevoix, Boyne City, Boyne Falls, and Indian River love this weekend. Check our Calendar of Events for information on special activities. Come North!